This item was created to expand on any Halloween book read. It can be used as whole group practice, small group practice, or for individual practice. It is specifically used for identifying what happened in the beginning, middle, and, end of a story. Since it was designed for first grade in October the middle portion is to simply draw a picture. 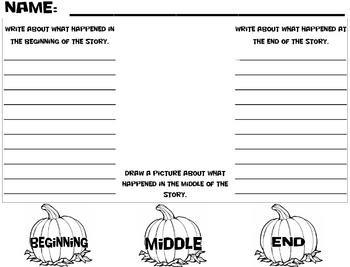 The beginning and end of the story chart the kids should try to write a few words or a complete sentence.